Copyright: © 2014 Pulikkotil SJ, et al. This is an open-access article distributed under the terms of the Creative Commons Attribution License, which permits unrestricted use, distribution, and reproduction in any medium, provided the original author and source are credited. 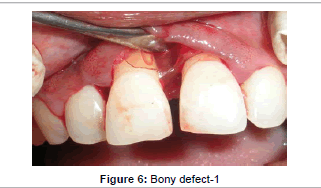 Background: The treatment of periodontal intrabony defect can be a challenge to clinicians especially with the use of barrier membrane in guided tissue regeneration (GTR). The mechanical and biological regenerative potential of barrier membrane could be enhanced with the use of fibrin sealant. The purpose of this case report was to describe a surgical procedure achieving regeneration with fibrin sealant application in combination with guided tissue regeneration (GTR) to eliminate intrabony defect. Methods: A 21 year old systemically healthy female had the complaint of swelling and bleeding from gingiva in maxillary anterior region since 6 months. On clinical examination, there was a high frenal attachment penetrating deep into the palatine papilla leading to midline diastema. The papilla caused opening of the gingival margin in the palatine region leading to pocket formation in mesial side of 7 mm and 5 mm in relation to 21, 12. Radiographic examination revealed an intrabony defect in the same region. Due to persistence of pocket after frenum excision, surgical treatment for GTR was planned with use of bio-resorbable collagen membrane and fibrin sealant application. Results: The patient was followed for 9 months post-operatively. Reduction in probing depth was observed in 6 month and radiographic bone fill at 9 months. The probing depth was reduced to 3 mm in relation to 21 and 12. The gingival tissues appeared healthy with no bleeding on probing or gingival recession. Conclusion: This case report shows the possibility of achieving periodontal regeneration over a localized intrabony defect with the combined use of GTR membrane and fibrin sealant. An adjunctive regenerative technique is presented that allowed space making, stabilization of membrane, early wound healing as well as local taxis of growth factors for regeneration of periodontal tissues. Clinical implication: The use of fibrin sealant boosted the regenerative potential of barrier membrane showing potential of new bone formation and early wound healing. The basic concept of conventional periodontal regenerative treatment is reduction or elimination of tissue inflammation induced by bacterial plaque and its by-products, correction of defects or anatomical problems caused by the disease process, and regeneration of lost periodontal tissues as a consequence of disease destruction . Guided tissue regeneration (GTR) has been widely used for this purpose as it has a “space making effect”, leading to regeneration of periodontium . The rationale of GTR is to place a barrier membrane over the denuded root surface and the debrided periodontal defect to exclude epithelial growth and allow periodontal ligament and alveolar bone cells to repopulate the isolated space . Biodegradable collagen membranes, both synthetic and natural are popular and have been used by several authors [3,4]. The results have not been consistent with the use of these membrane, some have shown regeneration while others have found no difference when compared against open flap debridement [5,6]. The varied results seen among them could be explained by lack in expression of biologic potential for regeneration by the barrier membranes . The major problem with the use of GTR membrane is the deficiency in maintenance of space and stability, early exposure and resorption of barrier membrane, and this overall influences the healing process [8,9]. Over the last two decades several methods have been used to enhance the regenerative capacity of membranes. Different biomaterials and products include bone graft and amelogenin to prevent collapse of membrane, wound healing modifier or biologic response modifiers like growth factor and root biomodifier to enhance the existing regenerative potential and promote early wound healing [3,10-12]. Fibrin sealants (FS) are biologically derived substance with fibrinogen and thrombin being its major constituent mimicking the final leg of clotting cascade . Tal et al. treated fenestration defects with collagen membranes and showed that the submembraneous blood clot was sufficient for the regeneration of cementum, periodontal ligament and bone. Similarly FS provides an artificial clot that persists longer than the natural clot because of presence of aprotinin, an anti-fibrinolytic agent . The clot formed by fibrin sealant would provide stability and maintain space underneath the membrane and additionally increase the overall regenerative and healing potential. Previous studies have showed enhanced regeneration and early wound healing with use of fibrin sealant [7,15-18]. Therefore FS could be used to enhance and overcome the drawbacks of barrier membrane for the treatment of deep intrabony defect. In this case report we used a combination of resorbable barrier membrane and fibrin sealant system for the treatment of intrabony defect. A 21 year old, female patient reported to the Department of Periodontology, Chhattisgarh Dental College and Research Institute, Rajnandgaon, in January 2013. Her complaint was of swelling and bleeding from gingiva in maxillary anterior region since 6 months, which was “increasing over time”. The patient had a non-significant medical history. Intra-oral examination revealed presence of high frenal attachment of papilla penetrating type and spacing between central incisors (Figure 1). 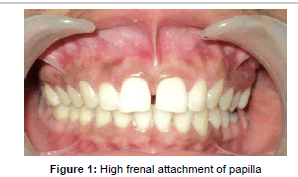 A blanch test was performed by stretching of the upper lips and observing the location of alveolar attachment while exerting intermittent pressure on the frenum. The test was considered positive as the band of tissue with a broad fan like base was attached to the palatine papilla and blanching was produced in the area. Moderate plaque accumulation was seen in maxillary anterior region with a score of 1.2 . The gingiva was inflamed with respect to 11, 21, and was soft in consistency. Probing evoked bleeding from the same region. Periodontal pocket detected in relation to the labial aspect of 11, 21 was 4 mm and 6mm; while 7 mm and 5 mm on the palatal aspect (Figure 2). No mobility or recession was noted in any of the involved teeth. The periodontal status of all the remaining teeth was healthy. Radiographic examination presented with angular bone loss extending middle half of the tooth root in the maxillary anterior region along the mesial aspect of 21 (Figure 3). Based on these findings a diagnosis of localized chronic periodontitis was made. Proper plaque control methods were reinforced and scaling and root planing was performed. 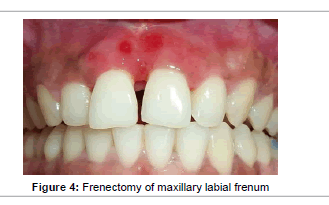 Frenectomy was done for maxillary labial frenum after one week and revaluation was done 4 weeks after the procedure (Figure 4). 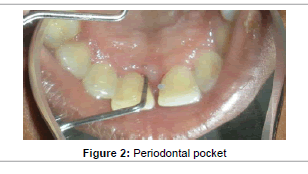 Persistence of periodontal pockets was detected in relation to mesial aspect of 11 and 21. Following consultation with the patient, the decision was made to perform regenerative periodontal surgery with the use of fibrin sealant and GTR membrane. Prior to surgery, the patient rinsed for 60 seconds with a 0.2% chlorhexidine mouthrinse. The maxillary anterior quadrant extending from distal of right lateral incisor to distal surface of lateral incisor underwent conventional flap surgery. Following local anesthesia using 2% Lignocaine with adrenaline (1:200000), transgingival probing was done to determine the bone defect. Sulcular incision was given and a full thickness mucoperiosteal flap was raised on buccal and palatal surfaces. Granulation tissue was removed and root instrumentation performed. A large two–walled bone defect was observed in relation to 21 which measured to 9 mm in height and 2 mm in width (Figure 5). A tin foil was used as template and the GTR membrane was trimmed accordingly to an H-shape. With fibrin sealant (Tisseel® Baxter Healthcare, Deerfield, IL, USA) as the adhesive, bio-absorbable collagen membrane (Periocol GTR®, Eucare Pharmaceuticals P. Ltd., India) was used to cover the bony defect (Figures 6 and 7). The reconstitution of fibrin sealant was done as per manufacturer’s instruction. The flaps were then coronally repositioned and approximated using 5-0 bioabsorbable vicryl suture (Johnson, Ethicon, USA). Horizontal mattress sutures and a non eugenol periodontal dressing (Coe-Pak®, GC America, Alsip, IL.) was given (Figure 8). Postoperatively, 600 mg ibuprofen, three times/ day for 5 days and 500 mg amoxicillin, three times/day for 7 days were prescribed. The patient was instructed not to brush the surgical site for three weeks and to rinse with chlorhexidine digluconate 0.2% during this period for two minutes twice daily. The area was redressed every week for three weeks. Professional oral prophylaxis was performed every week during the first postoperative month and every other week in the next two month. 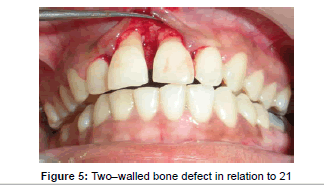 Figure 5:Two–walled bone defect in relation to 21. 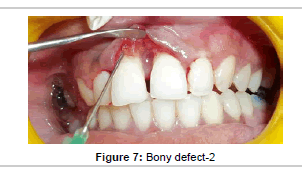 Figure 8:Horizontal mattress sutures and a non eugenol periodontal dressing. Local tissue reaction and membrane exposure was also evaluated at every visit. Patient was assessed for potential side effects of fibrin sealant like hypersensitivity to bovine aprotinin, which could lead to severe bleeding. During the 7 days following surgery, patients filled out a questionnaire to evaluate the experience of post operative complaints Questions relating to experienced pain, type of pain, use of analgesics, increase of pain or discomfort during brushing and eating, and swelling and bleeding of the gingival area were filled in by the patient. For the recording of the experienced pain and discomfort, a visual analogue scale (VAS) was used. For clinical and radiographic evaluation the patient was recalled at 3, 6, and 9 months. No soft tissue reaction or exposure of membrane was observed during the follow-up visits. No other adverse reactions or side effects were noted. After 7 days of post operative healing minimal pain and discomfort was noted with VAS score of 3 and 4. Three months after surgery clinical examination was performed. Plaque accumulation was minimal with a score of 0.8. The gingival tissues were healthy with no signs of inflammation and bleeding on probing. 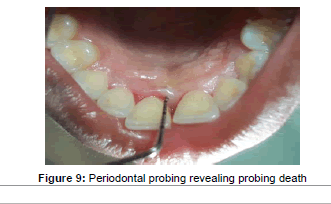 Periodontal probing was performed only after 6 months, revealing the probing depth was reduced to 3 mm (Figure 9). The periodontal tissue appeared healthy with absence of bleeding and gingival recession. The plaque score was 0.5, indicating the patient was maintaining good oral hygiene. After 9 months the probing measurement remained same with good healing of gingival tissues. 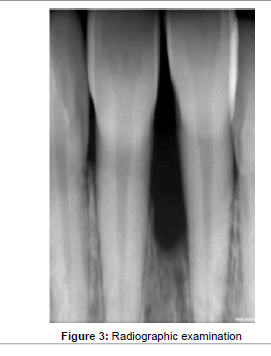 The radiographic examination revealed bone fill of the intrabony defect (Figure10). The case presented here highlights the combination use of resorbable collagen membrane and fibrin sealant in the treatment of deep intra-bony effect. The localized periodontal defect in the maxillary anterior was caused by the presence of papillary penetrating type frenal attachment. The frenum pull caused opening of marginal gingiva in palatal region leading to increase in plaque accumulation and calculus deposition. As its presence precluded maintenance of good oral hygiene and therefore leading to progression of periodontal disease . Therefore after frenectomy, regenerative therapy was planned for the treatment of intrabony defect between the maxillary teeth. Various methods and technique have been developed following two distinctive paths for the regeneration of intrabony defect. One is novel surgical techniques and other is use of regenerative materials. Former includes clinical innovation in flap design and handling. The recent flap techniques used are simplified papilla preservation flap, minimally invasive technique (MIST) and modified MIST . While in the area of regenerative material, three different regenerative concepts have been explored: barrier membrane, grafts and wound healing modifiers and a combination of these materials. In our study we planned for combination of two different materials, fibrin sealant and GTR membrane [10-12]. Figure 9:Periodontal probing revealing probing death. 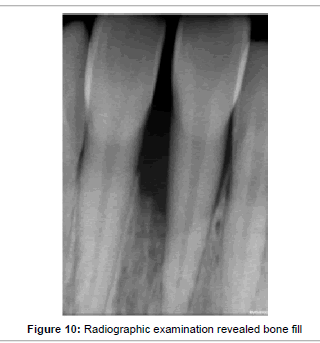 Figure 10:Radiographic examination revealed bone fill. Guided tissue regeneration is the procedure based on prevention of migration of the epithelial periodontal tissues into the osseous defect, allowing time for bone and other attachment tissues to heal . Melcher suggested that certain cells residing in the periodontium have the potential to create cementum, alveolar bone and periodontal ligament and coordination between these three tissues is essential for regeneration . It was hypothesized that such condition arises when epithelial cells or fibroblasts are excluded from the wound space and periodontal ligament cells are allowed to migrate coronally . Hence forth the placement of a barrier membrane would thus ensure that the detached root surface becomes repopulated with cells from periodontal ligaments capable of forming bone, periodontal ligament and cementum . The two types of membrane available are non resorbable and resorbable. Non resorbable membrane retain their build and form in the tissue but require a second surgical procedure for their removal causing increased patient visit, discomfort, duration, cost and disrupts initial healing . To overcome these drawbacks, resorbable membranes were used. Resorbable membranes are of two types, natural and synthetic . In our report we decided to use natural resorbable collagen membrane derived from fish. Collagen attracts and activates periodontal ligament and gingival fibroblast cells; in addition it is haemostatic and biocompatible. Collagen membrane showed inconsistent results due to insufficient stability and lowered space maintenance due to collapse and early resorption, all leading to compromised healing and regeneration . An ideal GTR membrane should have the following property; cell exclusion, biocompatibility, space maintenance, tissue integration and ease of use . In addition the membrane should be biologically active but till now there are no membrane fulfils all the above criteria. To overcome these shortcomings fibrin sealant was used in addition to resorbable collagen membrane to boost its regenerative potential. Fibrin sealant is a two component system which on combination forms fibrin clot which is having adhesive and haemostatic property [13,15,16,24]. In several experiments fibrin sealant was used to fix flaps and grafts and after 1 week found it to have superior healing than conventional suturing [15,16]. In our study the additional use of a fibrin sealant material provided superior results with regeneration of bone. It resulted in probing depth reduction and gain in hard tissue probing and better clinical healing. Similar finding was also seen by several authors using FS and GTR procedures in humans [25,26] and in animals [7,27]. We placed fibrin sealant in between the root surface and membrane. Fibrin sealant allowed; cell exclusion, space maintenance tissue integration, regeneration and easy handling. Cell exclusion property requires the membrane to separate gingival flap from the coagulum in the wound space. Fibrin sealant promotes clot formation and increase clot strength by forming cross links with fibrin which further prevents its proteolytic cleavage. Early clot adhesion to the root surface promotes periodontal regeneration and serves as a barrier to the apical migration of junctional epithelium . The next property is space maintenance; the membrane should withstand masticatory forces, flap tissue tension and prevent collapse of soft tissues or reduction of the wound space. The clot formed from FS between the membrane and root surface provides space for bone regeneration and also gives stability to the overlying membrane. FS provided high compatibility and good mechanical strength to the barrier membrane . The third essential property is tissue integration. Tissue integration property ensures wound stabilization and inhibition of epithelial migration, resulting in gain of attachment level. In our report reduction in probing was achieved with the use of FS. Fibrin sealant promotes new attachment and bone regrowth when placed over denuded root surface and similar effect was seen in our case report [28-31]. Fibrin sealant promotes regeneration by three mechanisms; osteoblasts proliferation, clot stabilization and presence of fibronectin and growth factor. Bosch et al. have shown that fibrin sealant produced an early enhancement of bone repair in rabbits. The physical properties of the bony callus seemed to be enhanced by its use . Although Caton et al. contradicted these results. Isogai et al. reported that fibrin clots support growth, adhesion, migration, and differentiation of osteoblasts in vitro. In addition FS contains several factors which can promote regeneration such fibrinogen, fibronectin, Factor XIII and platelet derived growth factor (PDGF). Fibrin and factor XIII are known to promote fibroblast adhesion and multiplication . Fibronectin enhances wound healing by promoting new attachment by the growth of fibroblast and their attachment to root surfaces and forms covalent linkages with fibrin and collagen . PDGF is a polypeptide, which enhances fibroblast reduplication and helps in periodontal regeneration and repair . Therefore, the FS may act like osteoconductive materials on bone healing. Fibrin sealant has been as vehicle for delivery of mesenchymal stem cells and growth factors and BMPs for bone regeneration [36,37]. Lastly, the membrane should be easy to handle and manipulate allowing the clinician to conduct the surgical procedure without undue difficulty. Fibrin sealant made the membrane much easier to handle than suturing. Fibrin glues may have antibacterial properties as an undefined mechanism, evidenced by studies on skin grafts in infected sites . This property would be beneficial as resorbable membranes have the drawback of getting exposed, which could lead to infection and delayed wound healing. In conclusion, this study shows that combination use of fibrin glue and resorbable collagen fibrin supports bone formation. Therefore, placing fibrin glue provides adequate space and stability increased support and improved handling of the GTR membrane. Gottlow J. Periodontal Regeneration. Proceedings of the First European Workshop in Periodontology. Quintessence, London, UK. 1994:172–192. Karring T, Nyman S, Gottlow J, Laurell L (1993) Development of the biological concept of guided tissue regeneration — Animal and human studies. Periodontol 2000 1:26-35. Stoecklin-Wasmer C, Rutjes AW, da Costa BR, Salvi GE, Jüni P, et al. (2013) Absorbable collagen membranes for periodontal regeneration: a systematic review.J Dent Res 92: 773-781. Needleman IG, Worthington HV, Giedrys-Leeper E, Tucker RJ (2006) Guided tissue regeneration for periodontal infra-bony defects.Cochrane Database SystRev : CD001724. Villar CC, Cochran DL (2010) Regeneration of periodontal tissues: guided tissue regeneration.Dent Clin North Am 54: 73-92. Santosh Kumar BB, Aruna DR, Gowda VS, Galagali SR, Prashanthy R, et al. (2013) Clinical and radiographical evaluation of a bioresorbable collagen membrane of fish origin in the treatment of periodontal intrabony defects: A preliminary study.J Indian SocPeriodontol 17: 624-630. Cortellini P, Pini Prato GP, Tonetti MS (1995) No detrimental effect of fibrin glue on the regeneration of intrabony defects. A controlled clinical trial.J ClinPeriodontol 22: 697-702. Haney JM, Nilveus RE, McMillan PJ, Wikesjo UM (1993)Periodontal repair in dogs: Expanded polytetrafluoroethylene barrier membranes support wound stabilization and enhance bone regeneration. J Periodontol; 64:883-890. Sigurdsson TJ, Hardwick R, Bogle GC, Wikesjö UM (1994) Periodontal repair in dogs: space provision by reinforced ePTFE membranes enhances bone and cementum regeneration in large supraalveolar defects.J Periodontol 65: 350-356. Trombelli L, Farina R (2008) Clinical outcomes with bioactive agents alone or in combination with grafting or guided tissue regeneration. J Clin Periodontol.35:117-135. Esposito M, Grusovin MG, Papanikolaou N, Coulthard P, Worthington HV (2009) Enamel matrix derivative (Emdogain) for periodontal tissue regeneration in intrabony defects. A Cochrane systemic review. Eur J Oral Implantol 2: 247-66. Ivanovski S (2009) Periodontal regeneration.Aust Dent J 54 Suppl 1: S118-128. Pini Prato GP, De Paoli S, Corteliini, P, Zerosi C, Clatjser C (1985)On the use of a biologic sealing system (Tissucol) in periodontal therapy (II). Histologic evaluation. Int J Periodontics Restorative Dent 5: 32-41. Tal H, Pitaru S, Moses O, Kozlovsky A (1996) Collagen gel and membrane in guided tissue regeneration in periodontal fenestration defects in dogs.J ClinPeriodontol 23: 1-6. Pini Prato GP, Cortellini P, Agudio G, Clauser C (1987) Human fibrin glue versus sutures in periodontal surgery.J Periodontol 58: 426-431. Pulikkotil SJ, Nath S (2013) Fibrin sealant as an alternative for sutures in periodontal surgery.J Coll Physicians Surg Pak 23: 164-165. Romanos GE, Strub JR (1998) Effect of Tissucol on connective tissue matrix during wound healing: an immunohistochemical study in rat skin.J Biomed Mater Res 39: 462-468. Fabris G, Trombelli L, Schincaglia GP, Cavallini R, Calura G, et al. (1998) Effects of a fibrin-fibronectin sealing system on proliferation and type I collagen synthesis of human PDL fibroblasts in vitro.J ClinPeriodontol 25: 11-14. Silness J, Löe H (1966) Periodontal disease in pregnancy. 3. Response to local treatment.ActaOdontolScand 24: 747-759. Koora K, Muthu MS, Rathna PV (2007) Spontaneous closure of midline diastema following frenectomy.J Indian SocPedodPrev Dent 25: 23-26. Mishra A, Avula H, Pathakota KR, Avula J (2013) Efficacy of modified minimally invasive surgical technique in the treatment of human intrabony defects with or without use of rhPDGF-BB gel: a randomized controlled trial.J ClinPeriodontol 40: 172-179. Karring T, Warrer K (1992) Development of the principle of guided tissue regeneration.Alpha Omegan 85: 19-24. Gottlow J, Nyman S, Lindhe J, Karring T, Wennström J (1986) New attachment formation in the human periodontium by guided tissue regeneration. Case reports.J ClinPeriodontol 13: 604-616. Bartolucci EG, Prato GP (1982) Preliminary observations on the use of a biologic sealing system (Tissucol) in periodontal surgery.J Periodontol 53: 731-735. Pini Prato GP, Cortellini P, Clauser C (1988) Fibrin and fibronectin sealing system in a guided tissue regeneration procedure. A case report.J Periodontol 59: 679-683. Cortellini P, Pini Prato G, Baldi C, Clauser C (1990) Guided tissue regeneration with different materials.Int J Periodontics Restorative Dent 10: 136-151. Cortellini P, DeSanctis M, Pini Prato G, Baldi C, Clauser C (1991) Guided tissue regeneration procedure using a fibrin-fibronectin system in surgically induced recession in dogs.Int J Periodontics Restorative Dent 11: 150-163. Ripamonti U, Petit JC, Lemmer J, Austin JC (1987) Regeneration of the connective tissue attachment on surgically exposed roots using a fibrin-fibronectin adhesive system. An experimental on the baboon (Papioursinus). J Periodontal Res.22:320-326. Warrer K, Karring T (1992) Effect of Tisseel on healing after periodontal flap surgery.J ClinPeriodontol 19: 449-454. Caffesse RG, Holden MJ, Kon S, Nasjleti CE (1985) The effect of citric acid and fibronectin application on healing following surgical treatment of naturally occurring periodontal disease in beagle dogs.J ClinPeriodontol 12: 578-590. Soffer E, Ouhayoun JP, Anagnostou F (2003) Fibrin sealants and platelet preparations in bone and periodontal healing.Oral Surg Oral Med Oral Pathol Oral RadiolEndod 95: 521-528. Bösch P, Lintner F, Arbes H, Brand G (1980) Experimental investigations of the effect of the fibrin adhesive on the Kiel heterologous bone graft.Arch Orthop Trauma Surg 96: 177-185. Keller J, Andreassen TT, Joyce F, Knudsen VE, Jørgensen PH, et al. (1985) Fixation of osteochondral fractures. Fibrin sealant tested in dogs.ActaOrthopScand 56: 323-326. Caton JG, Polson AM, Prato GP, Bartolucci EG, Clauser C (1986) Healing after application of tissue-adhesive material to denuded and citric acid-treated root surfaces.J Periodontol 57: 385-390. Isogai N, Landis WJ, Mori R, Gotoh Y, Gerstenfeld LC, et al. (2000) Experimental use of fibrin glue to induce site-directed osteogenesis from cultured periosteal cells.PlastReconstrSurg 105: 953-963. Drinnan CT, Zhang G, Alexander MA, Pulido AS, Suggs LJ (2010) Multimodal release of transforming growth factor-Î²1 and the BB isoform of platelet derived growth factor from PEGylated fibrin gels.J Control Release 147: 180-186. Zhang G, Wang X, Wang Z, Zhang J, Suggs L (2006) A PEGylated fibrin patch for mesenchymal stem cell delivery.Tissue Eng 12: 9-19.